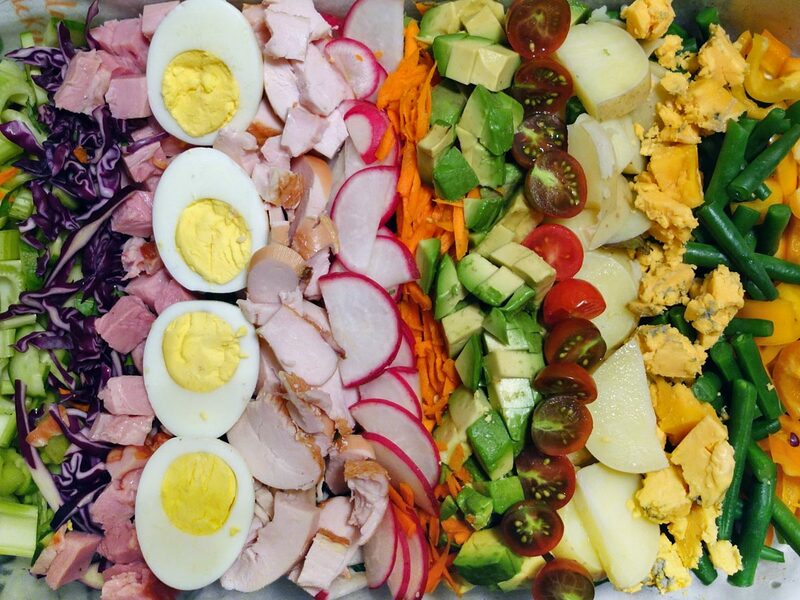 The way you remember what’s in the classic Cobb salad is by using the acronym EAT COBB: Egg, Avocado, Tomato, Chicken, Onion, Bacon, Blue cheese. I tend to be rebellious when it comes to food, plus I love a bit of overkill and I like to use up leftovers in the fridge. The acronym for my Cobb Salad Gone Wild would start with EAT COB (mine had ham instead of bacon) on, say, a Scrabble board. Then, imagine a two-year-old appearing magically from nowhere, grabbing the Scrabble tile bag and throwing it on the floor, with completely random letters falling out—doesn’t that happen at your house? It’s unlikely the resulting letters would spell anything in English: EAT COB HRCCCYGKM. Perhaps you could spell something in one of the Slavic languages. If you come up with something coherent let me know in the Comment section. However this salad does spell D-E-L-I-G-H-T-F-U-L and D-E-L-I-C-I-O-U-S! Your guests will love all the contrasting colors. I served it with Mustard Tarragon Vinaigrette because it’s my latest addiction. You can use a classic red-wine vinaigrette or any dressing you love. You can follow a recipe and eat very well, or do your own thing and eat EXACTLY what you want, which I think is even better. I’m a rule-breaker and I encourage you to do the same. You can put anything in this Franken-salad. Just make sure the colors contrast as you build it and expect GASPS from your guests. Cut your veggies and meats as you like. Place greens on a platter or in a glass baking dish. Think about contrasting the colors as you arrange the ingredients in rows widthwise over the greens. In a small bowl, mix mustard, vinegar and tarragon. Slowly whisk in the olive oil until it’s emulsified. Add salt and freshly ground pepper to taste.